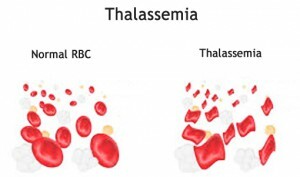 Thalassemia Treatment – Can Homeopathy help? Thalassemia is group of inherited blood disorders in which the body produces an abnormal form of hemoglobin, which results in destruction of red blood cells. Hemoglobin is the substance in your red blood cells that allows them to carry oxygen. In the mild form of the disease, you may have no symptoms but may pass on the faulty genes to your children or may constantly suffer from mild anemia throughout your life. In a more severe form called the Hemoglobin H disease, there is severe anemia and enlargement of the liver and spleen. Bone deformities and fatigue are other symptoms that occur along with anemia. The most severe form called as Hydrops fetalis, usually causes a fetus to die before delivery or a newborn to die shortly after birth. Where the person survives, they require life-long blood transfusions for survival. Depending on the severity, symptoms like difficulty in breathing, jaundice, enlarged spleen or liver, bone pains, abnormal growth of facial bones, poor growth, short stature and hormonal imbalance may be seen. What are the Thalassemia treatment options? Minor forms of thalassemia do not require any specific treatment other than iron supplementation whenever hemoglobin level is low. If you have hemoglobin H disease or beta thalassemia intermedia, you may need blood transfusions on occasion like during surgery, after delivery or severe infections. Transfusions of red blood cells are the main treatment for people who have moderate or severe thalassemias. The hemoglobin in red blood cells is an iron-rich protein. Thus, regular blood transfusions can lead to a buildup of iron in the blood. This condition is called iron overload. It damages the liver, heart, and other parts of the body. To prevent this damage, iron chelation therapy is given to remove excess iron from the body. Folic acid helps in building healthy red blood cells and is given in addition to Thalassemia treatment with blood transfusions and/or iron chelation therapy. A bone marrow stem cell transplant replaces faulty stem cells with healthy ones from another person (a donor). Stem cells are the cells inside bone marrow that make red blood cells and other types of blood cells. A stem cell transplant is indicated in severe forms of thalassemias but only a small number of people who have severe thalassemias are able to find a good donor match and have the risky procedure. Can homeopathy help in Thalassemia treatment? Homeopathy can offer supportive role in cases of thalassemia. Homeopathic medicines can improve the vitality and immune status of the person. It can control the frequent infections and can improve the overall health. Homeopathic medicines regulate the specific gene expression responsible for the synthesis of the abnormal hemoglobin. Homeopathy can reduce the frequency of blood transfusion and can improve the quality of life of the person. The homeopathic medicines being without any known side-effects seem to have great potentials in bringing additional benefits to thalassemic patients. If you are suffering with thalassemia and need frequent blood transfusions homeopathy may be what you need along with conventional treatment. At LifeForce, quite a few patients with thalassemia have benefitted with homeopathic medicines as a supportive therapy. Sir i humbly requesting you to please suggest some homoeopathic medicines which can play a role in the treatment of thalacemia. Thank you for contacting Life Force Homeopathy. Please fill your contact information on https://www.askdrshah.com/contact-us.aspx and our team of expert doctors will get back to you. You can also give us a call on +91-22-66-888888.